Today I am so excited to spotlight a product of ours that has the entire office buzzing: Twisted Cotton Rope! There are so many things I am excited to share with you about this fantastic product, so let’s just jump right in. Twisted Cotton Rope is an ultra-soft rope commonly used for a variety of purposes such as crafting, tent line, knot tying, décor for your home, and more! This truly versatile rope is soft to the touch, and is easy to tie knots in and splice. Solid color construction makes this rope vibrant and colored to the core! Available in a variety of colors and shades, this rope will quickly work its way into your next project or craft. My personal favorite colors of cotton rope are the mixed blends Cookie Monster, Camo, Black & Orange, and Holly Jolly. The patterns are so fun to use and pair nicely with any of our solid or sparkle colors. If choosing a color can be too much of a hassle, you can always use our Natural Cotton Rope (which is white in color) and dye it yourself! Our rope is available a variety of diameters and sizes ranging from 10 to 1000 feet! Check out our handy size chart below for all our sizes. Colored rope is available in convenient diameters of 1/2" and 1/4". To top it all off, your new favorite rope is made in the USA! Twisted Cotton Rope is used in weddings for both decoration and symbolism. Use cotton rope for a symbolic knot tying in your ceremony (instead of more traditional methods that involve candles or sand). The wide variety of colors can be matched to your wedding theme for a unique touch to your ceremony. Twisted Cotton Rope is also a great addition to table décor at a formal event. Create a monkey fist out of 1/2" cotton rope and place table names or numbers in the top to direct guests to their seats. Craft small monkey fists to give out as party favors, string rope in the rafters, wrap rope around chairs, and more! There is no end to the creativity you can have with our rope. Twisted Cotton Rope is perfect for pet toys! The soft cotton fibers will withstand your dog’s chewing, but also be soft and comfortable on their teeth. The dye used on our rope is safe for pets too, so no more worries about what your pet is chewing on. Tie rope into knots and use as a tug toy, or add in a tennis ball for a fetch toy. It can also be used as pet leashes and leads. 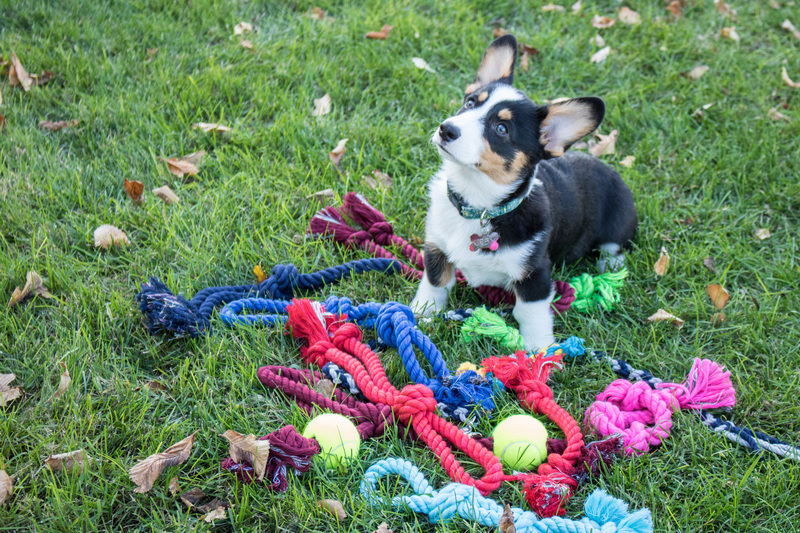 We made and tested out a few dog toys on Marketplace Specialist Amy's puppy named Kirby, isn't he just the cutest?! I’m obsessed with everything home décor, but it can be costly and time consuming to figure out where each piece I buy fits into my home. Twisted Cotton Rope is an affordable and fun way to decorate your home for a specific season or year-round! Use red 1/4” rope for Holiday tree décor or as a garland around your stockings or other decorations. The black and orange colored rope is an awesome way to decorate your home for Halloween when it is used as a wrapping around porch handles. The natural rope in a small diameter such as 1/4" or 3/16” could be woven into a spider web or spooky ghost; perfect for trick or treaters! Can you see why we love this rope so much?! We’ve only touched the tip of the iceberg when it comes to uses for this versatile, durable, and colorful rope. Check out our entire selection of rope on our website. Show us how you use your twisted cotton rope by sharing with us on all our social media sites: Facebook, Twitter, Instagram, Pinterest, YouTube, and Google+.